Speaking of McCain, he would seem to have the greatest interest in taking Obama down a peg—or, according to the latest calculation from RealClearPolitics, about seven points in the polls. So why hasn’t he highlighted the Alinsky-Lucifer connection? Why hasn’t the McCain-Palin ticket raised this issue, knowing full well that if the candidates say it, reporters have to cover it? Good questions. Did I mention that the Republican nominee is down seven points? Oh sure, if John McCain had expressed admiration for a Lucifer admirer, that would have been news, but as we all know, there’s a media double standard on such things. 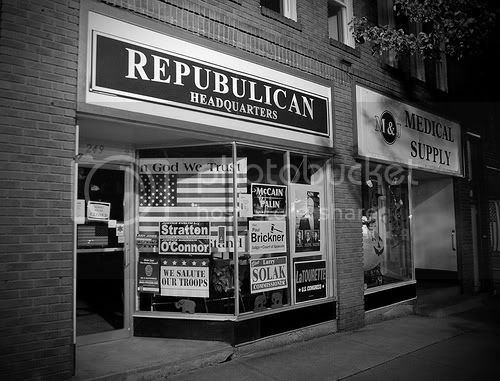 Those poor, misunderstood, discriminated-against Republicans. And, for that matter, let’s talk about the great state of Illinois, where three governors in the last 40 years—Otto Kerner, Dan Walker, and George Ryan—ended up not only convicted, but imprisoned. And a fourth, incumbent Rod Blagojevich, may also end up in the clink. That’s quite a streak of corruption. And what does Obama have to say about any of that? And what did he know, and when did he know it? Also, Barack Obama is from Illinois. And as we all know, people from Illinois are all corrupt. After all, Illinois isn't "real America" like the meth capital of Alaska. Is anyone really this stupid and paranoid? Just think, this is the country with all the nukes. Thanks for my morning "spew coffee outta my nose" laughter. Gotta love fox news! I only met Obama briefly in college. It was nothing really. What I object to is being mentioned even in the same article as Ann Coulter. I mean heck, even I have my standards. You should hear the freaks discuss Prop 8. I'm sorry but at least 60 percent of Americans are hateful bigots with serious issues. Hate hate hate and more hate. Boycott the country until some sanity returns. Until then, thanks for screwing up everyone else's worlds America!! Focus on the Family (Focus on your own damn family!) is getting downright apocalyptic about what it says will happen if Barack Obama is elected. Terrorist strikes on four American cities. Russia rolling into Eastern Europe. Israel hit by a nuclear bomb. Gay marriage in every state. The end of the Boy Scouts. All are plausible scenarios if Democrat Barack Obama is elected president, according to a new addition to the campaign conversation called "Letter from 2012 in Obama's America," produced by the conservative Christian group Focus on the Family Action. No more boy scouts? The horror!!! Holy heck. This is plain ole nutz. I've read lots of nutty one off things on blogs over the past few weeks but this, unbelievably, actually seems like it's an actual talking point that's been put out there. It's starting to pop up all over the place. The creepy thing is how people just pick this up and it spreads in things like comment sections. I just read "NoObma, he's a terroist, socialist, Satanist! McCain/Palin 08!!" WTF? Where did that come from? Then I came here and went wow, that's where I guess. So now it looks like that maybe 'satan workshipper' or 'satanist' can be added to the long list of descriptions that have been built up over the past three weeks. Unbelievable. It's on one hand one of the most hysterical things I've read this election and on the other hand the most troubling and terrifying that this is an ACTUAL TALKING POINT for many people! How does one even begin to parody this? Signs of a poor speller? Why can't the right wing spell? It's as sure as snow in winter that anything written by a right winger will be lousy with spelling mistakes, piss poor grammar, and racial slurs. We see lefties on babble with poor spelling and grammar all the time. I don't think it means much. This kind of snobbery is, unfortunately, why the left often doesn't connect with the people they claim they want to represent. Support our revolution, but stay away from us so you don't embarrass us with your stupidity. Why can't the right wing spell? I don't think babblers should be pointing fingers in that department. For a time here, I had an auto-spell checker, and I was surprised to see my posts in a more credible light. Spelling matters. Now, I'm back to the real me. Why would any "lefty" want to connect with these lunatics? 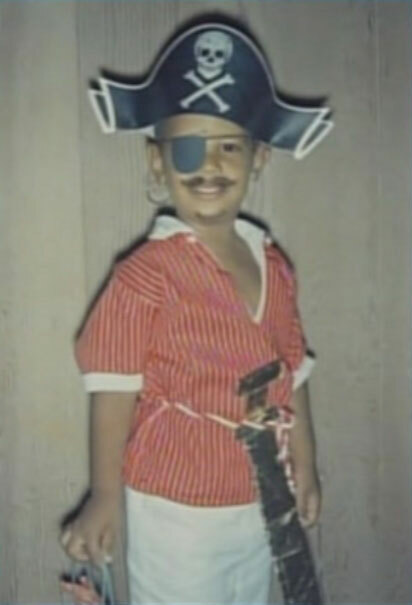 This photo just surfaced, showing presidential candidate Barack Obama dressed as a pirate when he was a child. I think it is clear, now, that he was not raised Christian as his camp has claimed. The evidence suggests he was raised not as a Christian, or Muslim - as some have said - but as a Pastafarian. I guess no one got the pun I was making by my use of the word "signs". What about being connected to the Fonz, Richie, Opie and Andy? We'll see how long that stays up before it's deleted. This photo just surfaced, showing presidential candidate Barack Obama dressed as a pirate when he was a child. I think McCain is the pirate (running about, shouting, dramatically swinging on ropes as a distraction, waving his gun in the air). Maybe it's bad grammar instead. Perhaps they mean to say that Obama is the most socialist - the socialest! There could actually be something to that.